First off, thank you so much for all of your encouraging comments on my last post! I’m happy to report that I am feeling better, although this was after I finally went to the doctor on Thursday (after 3 straight nights of waking up with coughing attacks) and found out that I have a cold that morphed into a sinus infection. So, I’m on antibiotics and am sleeping *so* much better. But, I must keep stitching on, and this brings me to my current project, a reproduction 1940s swing dress! I’m using the Sense and Sensibility pattern, as well as this neat novelty/geometric print silk twill fabric that I picked up at the Sewing Expo a few weeks ago from the Vogue Fabrics Store booth. I’d actually seen the fabric there before at previous expos, but never got it because I didn’t have any reason to use it (not that that has stopped me from buying fabric in the past, he hee), but I just couldn’t pass it up this time, and had the perfect use for it! Oh, and let’s just take a moment to talk about the amazing shoes I scored, which probably deserve their own blog post. Readers, I found on Etsy a pair of deadstock (i.e. 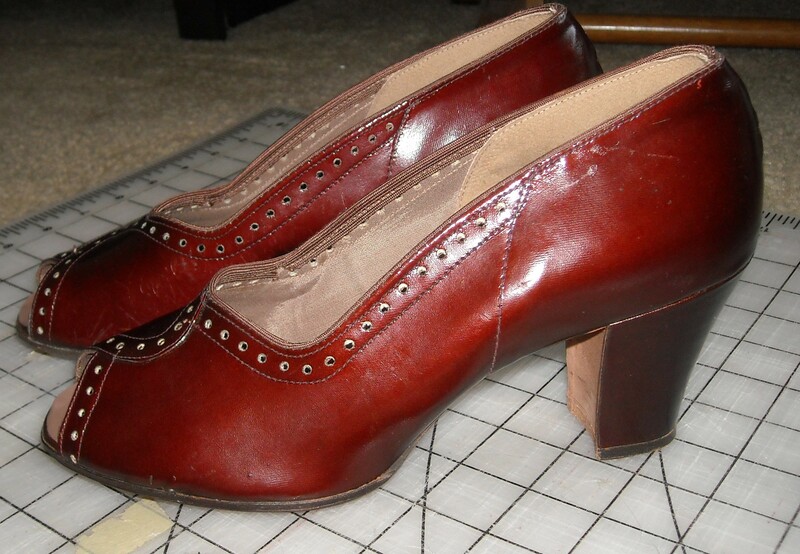 original and never worn) 1940s shoes in a size 7 1/2 for – get this – only $35. It gets better. When I tried them on, they fit like a glove, almost like they were molded around my feet. And they are like perfect, actual shoes from the 40s (not repros) that were never worn. Amazes me. I just want to put them on a shelf and stare at them all day, he hee. Anyways, back to sewing (LOL). 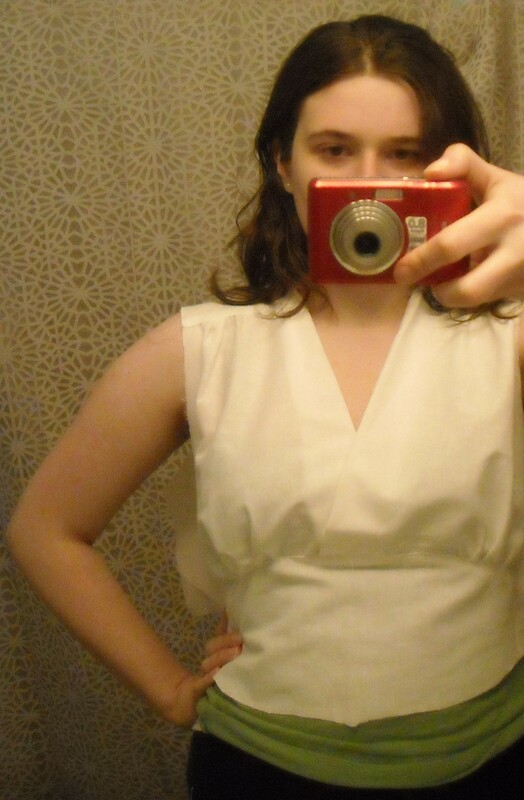 I managed to do a mock-up of the bodice after implementing a few pattern changes, and luckily it fits pretty well! Yes, I always wear yoga pants and a green tank when mocking up my bodices . . .
Alright, that’s it for now, lovelies! Hope everyone has a nice Easter! I’m glad you’re feeling better, but I am bummed you won’t be able to get your application in for Project Runway! Oh well, maybe it is a sign that now isn’t the time. Maybe next season! I can’t wait to see your finished swing dress!! I went through the same cold –> sinus infection thing about a month ago, after more than 3 weeks of having a cold I decided to humble up and go see a doctor 😀 Next time I’ll do that a little sooner. Glad you’re feeling better, too! Oh, man, I’m sorry you’ve been so sick! No fun! Feel better soon! But that fabric is going to be PERFECT as a swing dress! Can’t wait to see it! Glad you are feeling better Anna!